The World Poker Tour’s Five Diamond World Poker Classic returns next week. On December 5, the World Poker Tour returns to the Bellagio Resort & Casino in Las Vegas for the $10,400 buy-in WPT Five Diamond World Poker Classic Main Event. The six-day affair promises to be a massive event as the tournament has made a millionaire out of every winner since 2012. Looking to take a dive into the deep end? Here’s what players need to know about the tournament itself: the Five Diamond Main Event is one of the deepest offerings on the WPT schedule lasting a full six days with Day 1 starting on December 5 and cards in the air at Noon Las Vegas time. One of Las Vegas’ premier poker destinations, the Bellagio Resort and Casino plays host to the tournament as it has since it’s inception as the first event of Season I when a young Danish poker player named Gus Hansen bested the field of 146 to claim the first WPT title and $556,460. 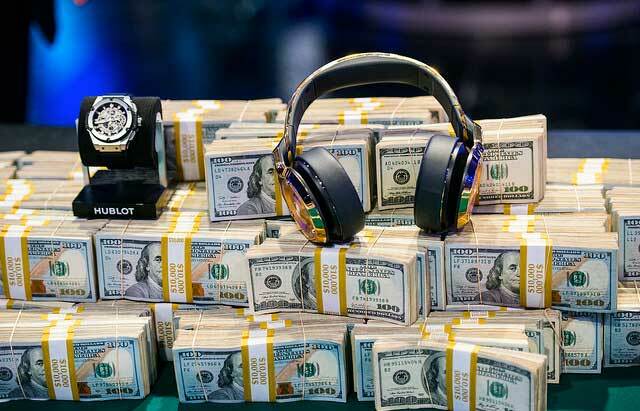 In fact, it can be argued that the Five Diamond World Poker Classic is the most recognizable of the WPT tour stops due to it’s rich history of massive prizepools and final tables packed with superstars. A list of past winners of the event reads like a fantasy team of poker all-stars that includes Daniel Negreanu, Joseph Hachem and Eugene Katchalov (when it was briefly re-branded as the Doyle Brunson North American Poker Classic), David ‘Chino’ Rheem, Daniel Alaei, James Dempsey and Antonio Esfandiari. In more recent years, as the number of entries began to swell, some of the most talented rising stars helped solidify their names as top professionals with victories including Mohsin ‘chicagocards1’ Charania, Ravi Raghavan and regular high roller “King” Dan Smith. One of the players to watch here in 2017 is last year’s winner, the defending Five Diamond champion, James Romero. Last year Romero bested a record field of 791 players, including fellow final tablists Justin Bonomo and Jake Schindler to take home over $1.9 million. The victory easily represented the largest score of the young Oregonians career and it not only launched him into the poker spotlight but sent him into a year of live grinding that brought him over $200,000 in earnings in 2017. This is the final event of the calendar year, but it’s just past the halfway point in the WPT season. Still, the chances are fewer for players to catch the current runaway WPT Player of the Year, Art Papazyan. But if history is an indicator, the field is expected to be on the larger size and, with it being the first $10,000 buy-in of the season, first place could be more than double any other first-place prize this season, including the Guo Liang Chen’s $789,058 take home for his win at the Borgata Poker Open. Preliminary events are running now with a pair of $25,000 High Rollers scheduled for December 8 and 9. For those looking to win their way into the Main Event, the Bellagio is holding a series of $1,100 satellites from December 3-6. The Final Table, set to take place on December 10, will be filmed for television complete with anchor Lynn Gilmartin and commentators Vince Van Patten and Tony Dunst on hand. Additionally, every hand will be streamed live via the PokerGo app.